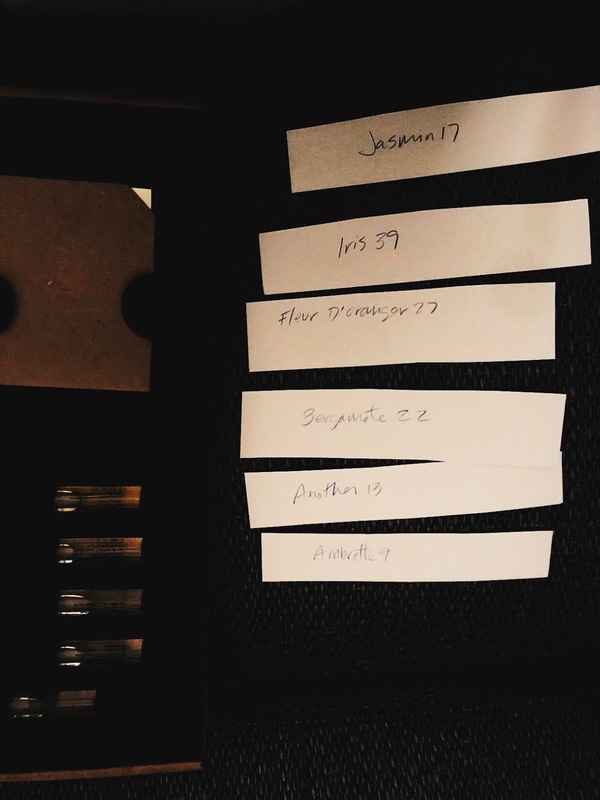 Looks Good from the Back: Blog Science: We Try 16 Different Le Labo Scents in One Night. 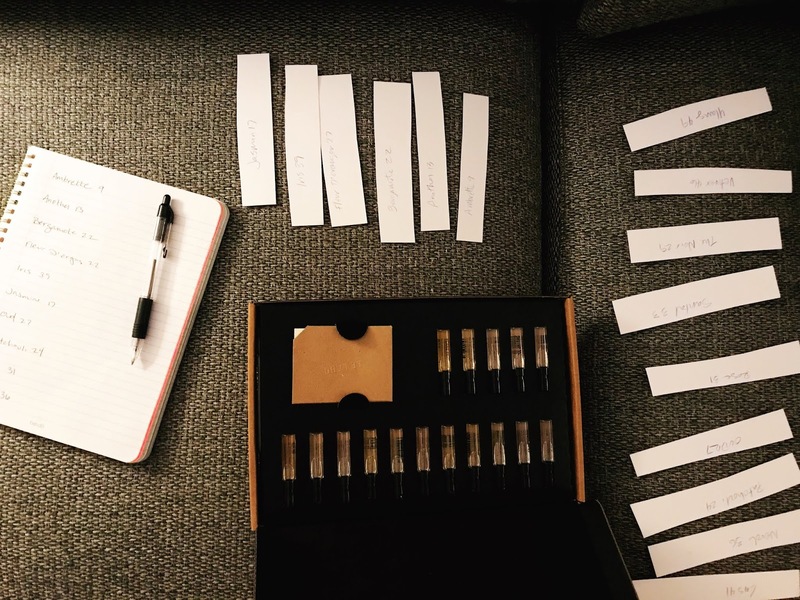 Blog Science: We Try 16 Different Le Labo Scents in One Night. Months ago I got an email from a really lovely reader who told me she'd bought a 16-sample Le Labo Discovery Set and would I like to be it's next recipient? Why yes, yes I would. (Thanks again, Betsey!) I tried out several but I am very sensitive to scents and there's nothing so off-putting as going through the day wearing a fragrance that's Not For You. I held onto the set until my recent visit with Marianne so we could test them all together. For Science. Blog Science. 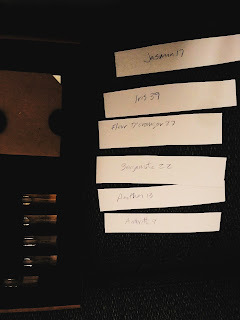 In our very (un)scientific approach we decided to spray each one on a strip of paper and record our thoughts. (I know this isn't the optimal way to test a fragrance because body chemistry but we needed to get it done.) Because we're not animals, we also grabbed some coffee beans to rest our poor noses between takes. We destroyed Marianne's cozy TV room in the process, just FYI. That was a lot! There are a few more I intend on trying on myself and then I'll send the box to Marianne for similar purposes. After that, who knows? Perhaps one of you wants it? A: Sorry for ruining your house. A: You're selling it anyway? This was entertaining! It's always so interesting to me how individual scent is. I love Bergamote 22 and hate Santal 33! Well, and I think fragrance is different when mixed with body chemistry so really, we're mostly doing it wrong. It was fun, though! I would love to try it, if there's any left after M is through! I got a little $6 sample of the Santal 33 on your recommendation, and LURVE it! Peppery and citrusy. I got a sample of the Santal 33 from a recent Nordstrom purchase. I tried it on and my husband LOVED the way it smelled. I, however, did not really care for it...it's not really my style. But I was so curious to try the fragrance that I've been hearing about everywhere! My wallet is glad that I didn't really like it, though! :) Thank you for the blog science experiment! On your recommendation, I went in search of Le Labo and found the store around the corner from my house here in Toronto. So I tried 3 samples last summer (Bergamote 22, Lys 41 & Santal 33) and while I wanted to love Santal 33 it was too strong for me. I now wear Bergamote 22 every day and love it (one spray only!) . I very much appreciate your blog science! Hooray! I'm glad you found one you loved. Thank you for doing blog science! Only the dumbest science for us! My husband asked me for birthday present ideas, and the Le Labo Santal was the only idea I gave him. Here's hoping!